June 28 is the feast day of the Redemptorist martyrs of Ukraine, modern-day men who gave their lives for the faith. Two were bishops, two were priests, and all were among the 25 Ukrainian martyrs beatified during Pope St. John Paul II’s visit to Lviv in 2001. Nicholas Charnetsky was born in Semakivci in Halychyna, Western Ukraine, in 1884. He completed his theological studies in Rome and was ordained a diocesan priest in 1909. After obtaining his doctorate in theology, he was spiritual director and professor of theology at the major seminary in Stanislaviv. He entered the Redemptorist novitiate in Zboisk in 1919 and was professed in 1920. During his early years he was assigned to teach in the minor seminary and subsequently to the giving of popular missions. He was ordained bishop in 1931 and appointed the Apostolic Visitor to the Ukrainian Catholics of Volyn. From 1931-39, he ministered to the people of Volyn, Polisia, Pidliasia, and Belorussia. During World War II he was in Lviv, ministering pastorally and teaching at the theological academy. From 1945-56, he was imprisoned in about 30 Soviet labor camps and prisons. Following his release in 1956, he returned to Lviv and acted as bishop of the suppressed Ukrainian Greek Catholic Church in Ukraine. He died in 1959. Vasyl (Basil) Velychkovsky was born in Stanislaviv, Western Ukraine, in 1903. He studied at the Major Seminary in Lviv and was ordained a deacon in 1923. He entered the Redemptorists as a deacon, professed vows in 1925, and was ordained a priest shortly after. After teaching at the minor seminary in Zboisk, Vasyl worked as a missionary for the next 20 years in rural Ukraine. He was arrested in 1945 and was condemned to death, but the death sentence was commuted to 10 years imprisonment. He was released in 1955. He was consecrated bishop by Metropolitan Slipyj in a hotel room in Moscow in 1963. He became the head of the Ukrainian Catholic Church in Ukraine. Arrested once more in 1969, he spent three years in prison. In the spring of 1972, near death, he was exiled from Ukraine. He died in Winnipeg, Canada, in 1973. It is believed that his death was caused by a slow-acting poison administered prior to his release from prison. Zenon Kovalyk was born in 1903 in Ivachiv Horishniy near Ternopil in 1903. He joined the Redemptorists and professed vows in 1926. He studied philosophy and theology in Belgium and was ordained in 1932. He went with Bishop Charnetsky to Volyn as a parish missionary and subsequently to Stanislaviv where he also conducted missions. Zenon was a fearless preacher of God’s Word and love of the Mother of God. He was arrested by the Soviets in 1940. While in prison he continued his pastoral ministry among the prisoners. When the Soviet prisons were opened on the arrival of the invading German army, Father Zenon’s body was found crucified to a wall of the prison of Zamartynivska in 1941. Ivan Ziatyk was born in 1899 in Odrekhova, southwest of Sanok (now part of Poland). He entered the Ukrai­nian Catholic Seminary in Peremyshl in 1919 and was ordained in 1923. He became prefect of the seminarians and taught theology and catechetics. He joined the Redemptorists in 1935, professing vows in 1936. He taught Scripture and dogmatic theology at the Redemptorist seminary in Holosko (near Lviv). Subsequent assignments were to the monastery in Ternopil as well as to the minor seminary in Zboisk (near Lviv) where he was superior of the community. 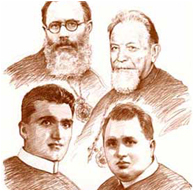 The difficult situation in which the Ukrainian Catholic Church found itself (with all its bishops arrested and with the Belgian Provincial expelled), resulted in Father Ivan holding the posts of the Provincial of the Redemptorists and the Vicar General of the Ukrainian Catholic Church. He was arrested in 1950 and condemned to 10 years imprisonment, but died of a savage beating in 1952.